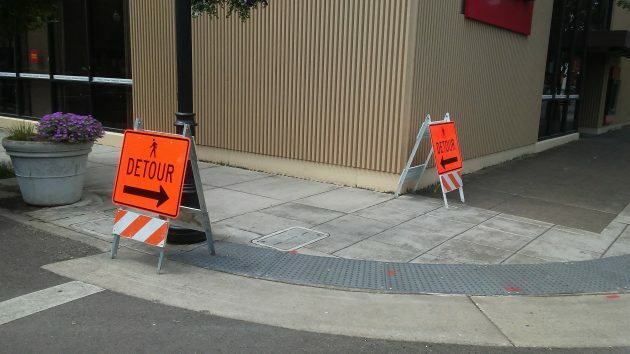 At first glance this detour looked contradictory, but on second glance I saw the little pedestrian on the yellow sign. 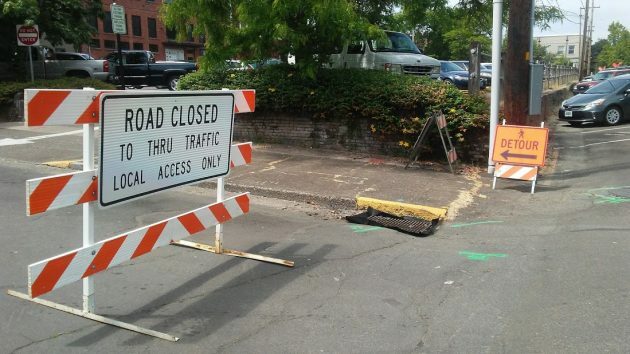 Looks like the city and the contractor are making sure walkers can find their way through the street construction in downtown Albany this summer. According to the schedule, actual digging in the Big Dig wasn’t supposed to start till June 12, but on Wednesday morning it looked like some of it got started early. This was at the corner of First and Broadalbin. More signs telling people on foot where they can go. 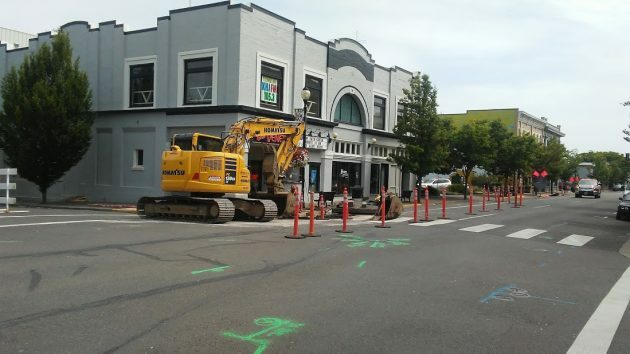 The $8 million project to rebuild sidewalks and pavement on several downtown streets will take all summer, but city officials have said downtown businesses and other venues will remain accessible during the construction. The Central Albany Revitalization Area, the city’s urban renewal district, is financing the work as part of its mission to restore the central area’s economic vitality. Attractive streets, with things like new trees and lighting, are one way to encourage private development and bring people downtown. That’s the hope, anyway. “Hope” is not a business case. CARA uses tax INCREMENT financing. This scheme promises that public “investments” like this project will provide a quantifiable return on investment. Is CARA going to fulfill their promise or are they playing games with city taxpayers? When CARA was performing due diligence what did their financial analysis reveal about how much increment will be generated? What? CARA didn’t estimate the ROI for this project? Why am I not surprised? Perhaps a series of inter-connecting Skybridges, weaving downtown into a wondrous web where no one’s feet need get wet, no one need break a sweat. CARA has the financial clout. Let’s Make Downtown Great Again! Thank you, Ray, for proving a point I have made about CARA on numerous occasions. Downtown is “already excellent”? I take this to mean that blight is no longer is a problem. “Excellent” and “blight” can’t be used in the same sentence to describe downtown. The legal and political justification for CARA leans heavily on an overarching public purpose: the elimination of “blight.” But what exactly is “blight”? Through many of its spending actions CARA has rendered “blight” a useless concept. Ray’s comment has just done the same thing. I disagree. The word excellent could be used as an adjective in order to add appropriate emphasis to the concept of blight. Obviously there are varying degrees of blight as is evidenced in CARA’s project-funding choices. Mr. Shadle seems to indicate that blight is a fixed term, incapable of gradation. The business of blight-assessment is not nearly so simple. Excellent blight can and must be used in the same sentence if Albany is to be able to move forward into the future. The core is the downtown. The center of the community. Why do you think River Rhythms is such a success? Year after year! “No Shade” Shadle and his ilk seek to hollow out the core. Much like the tRump admin. and the entire republican party. I ask WHEN WILL COUNTRY BECOME MORE IMPORTANT THAN PARTY? In Albany, the core is important. I am THANKFUL! of course this comment is less important bc of the handle. carry on. Excellent blight? You’ve just made my point. The term “blight” has been rendered useless, especially applied in the muddled way you just did. I didn’t define “blight.” The State did. mitigate the spread of disease, crime, and improve our morals? How much tax increment will be generated? Neither CARA or you are willing to provide a documented, quantifiable, and rational analysis of the expected return. Let’s be real – CARA is a slush fund to be used for any political purpose. It’s a convenient way to get around the Charter’s requirement for voter approval of debt. It’s a method to avoid the fiscal constraints of the general fund. And all it takes is a simple majority of the ARA (city council) to pull it off. Shameful. Ray Kopczynski is a tireless, and on rare occasion, a somewhat misguided zealot for Albany. For that the citizens of Our Fair City ought be grateful. Nevertheless, cheerleading is always best when done with dignity and a wink toward the inevitable infallibility of the human species. Heaven forbid our City Mothers and Fathers would feel it necessary to take up Trump’s ill-advised tweeting habit. Tweeting is particularly odious when regurgitated by the world’s 2nd Most Powerful Leader. It would be unbearably tedious were tweeting to become a regular feature of Albany leadership. Imagine a Kellum Tweet Storm at 6:00AM!